· An important part of the activities of humankind since the beginning of recorded history. · Today music plays a vital and important role in the lives of human beings. · It is found everywhere in our world. · One more stimulus in the vast ocean of stimuli gathered by our senses daily. · A medium to transmit sound vibrations throughout the environment - such as air or water. · A receiver to hear or record sound vibrations. · Many, many other natural vibrating sources. · Written on paper, so that the music may be performed again and again. · Enjoyment and understanding of most music is not dependent upon the ability to read and interpret written music notation. Melody—A succession of single tones or pitches that are perceived to be unified. · Interval—The distance and relationship between two pitches. · Shape—The direction a melody takes as it turns upward or downward, or remains static. · Phrase—As in language, a unit of meaning within a larger structure; thus, a melody may be divided into component phrases. fourth movement, "Ode to Joy"
· Cadence—A resting place in a musical phrase-musical punctuation. · Countermelody—An accompanying melody playing against the principal melody. Rhythm—The element of time in music. · Beat—Regular pulsation; a basic unit of length in musical time. · Accent—Emphasis on a note, so that it is louder or longer than another. · Measure—A rhythmic group or unit that contains a fixed number of beats, divided on the musical staff by bar lines. · Meter—The grouping of beats into larger, regular patterns, notated as measures. · Upbeat—The last beat of a measure, a weak beat, which anticipates the downbeat, the first beat of the next measure. · Downbeat—The first beat of a measure, the strongest in any meter. · Syncopation—Deliberate upsetting of the meter or pulse through a temporary shifting of the accent to a weak beat, or an offbeat. Polyrhythmic - The simultaneous use of several rhythmic patterns or meters. · Nonmetric—Music lacking a strong sense of beat or meter. Harmony —The simultaneous combination of notes and the ensuing relationships of intervals and chords. · Chord — Simultaneous combination of tones (typically three or more) that constitute a single block of harmony. · Scale — A series of tones or pitches in ascending or descending order. · Tonality — The principal of organizing a work around a central tonic, or home pitch, based on a major or minor scale. Texture—The interweaving of melodic (horizontal) and harmonic elements in the musical fabric. · Monophonic one voice/part presents a single melody. Example: Gregorian chant, "Kyrie eleison"
· Heterophonic: Two or more voices/parts elaborate on the same melody simultaneously. · Homophonic: principle melody and accompanying harmony. · Polyphonic: two or more melodies combine into a multi-voiced texture. Example: Mozart, Requiem, "Kyrie eleison"
Form—The structure or shape of a musical work, based on repetition, contrast, and variation; the organizing principle of music. Example: Saint-Saëns, Carnival of the Animals, "Fossils"
Example: Corelli, Suite for Strings, "Badinerie"
· Variation—A principle in which some aspects of the music are altered but still recognizable. Repetition, variation, and contrast are the foundational procedures on which music composition rests. · Theme—A melodic idea used as a basic building block in the construction of a composition. There are a variety of ways to create thematic development (motive, sequence, ostinato). 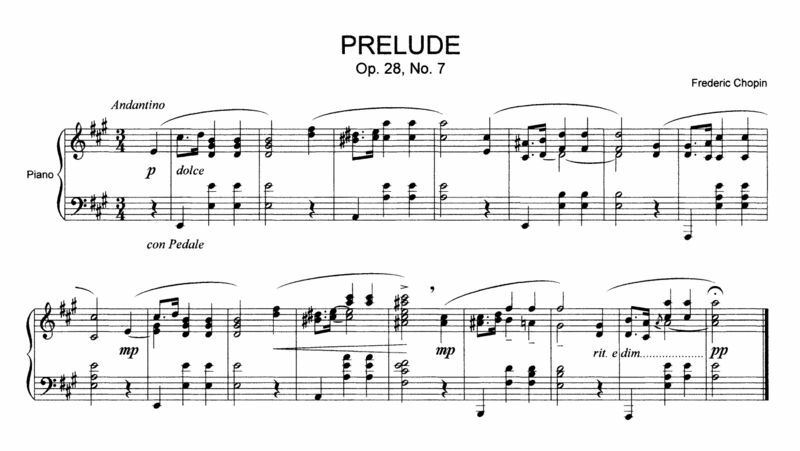 Motive—A small, thematic fragment that constitutes a melodic-rhythmic unit. Sequence—A restatement of an idea at a higher or lower pitch level. Ostinato—A short musical pattern – melodic, rhythmic, or harmonic- that is repeated persistently throughout a work or major section of a composition. In this example, a short (four-note) descending pattern in the bass is heard throughout under the voices. Dynamics—Designations for the relative loudness or quietness of music. · Decrescendo—The dynamic effect of gradually growing softer. · Sforzando —A sudden stress or accent on a single note or chord. Example: Tchaikovsky, The Nutcracker, "Trepak"
Timbre—The quality of a sound that distinguishes one voice or instrument from another. Also called "tone color." · Voices—The standard voice types are: (female) soprano, mezzo-soprano, alto; (male) tenor, baritone, and bass. Example: Grieg, Peer Gynt Suite, "Ase's Death"
· Woodwind family—Instruments where breath is used to produce sound across a reed or hole. (Flute, piccolo, clarinet, bassoon, oboe, bass clarinet and saxophone). Example: Beethoven, Symphony No. 9, fourth movement, "Turkish March"
· Brass family—Trumpet, French horn, trombone and tuba. Example: Mussorgsky, Pictures at an Exhibition, "Great Gate of Kiev"
· Keyboards—Instruments that are played by pressing keys that cause a hammer to strike a taught string. (Piano, harpsichord, and synthesizers).